Angela Merkel is pressuring Russian President Vladimir Putin to investigate and put a stop to reported abuses of the LGBTQ community in Chechnya. 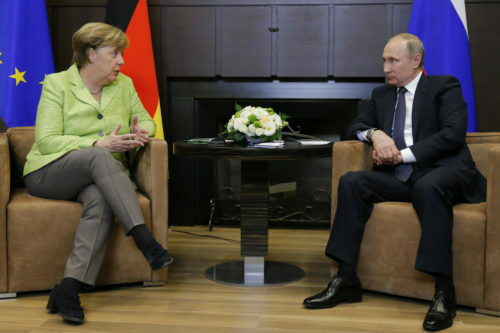 The German chancellor, visiting Russia for the first time in two years, said she raised the issue with Putin, along with other human rights issues, during a meeting. In a joint press conference with Putin in Sochi held afterward, she made clear that Germany is taking the reports seriously and urges Russia, of which Chechnya is a federal subject, to do likewise. Gay and bisexual men in Chechnya are being detained, beaten, and killed, and the Chechen president is reportedly trying to purge the country of queer men by Ramadan, which takes place at the end of this month. Chechen and Russian officials are denying the reports. A small group of demonstrators protesting the treatment of LGBTQ people in Chechnya were arrested this week by Russian police. “I pointed out again how important demonstration rights are in a civil society, how important the role of NGOs are, and in particular that we are getting negative reports about how gay people are being treated in Chechnya,” Merkel said, Putin standing right beside her. “I asked Vladimir Putin to use his influence to protect these minority rights, as it is being done in the case of the Jehovah’s Witnesses,” she continued. The Russian Supreme Court recently ruled that the country’s branch of Jehovah’ Witnesses was extremists, and that it was to be disbanded and its assets seized.